Have you ever stopped to think about the content of your prayers? I live in the U.S. where ironically, life is all about Us! Our own needs, our own wants, our own dreams. Sadly, this has seemed to bleed over into my personal prayer life. Praying for our own needs certainly isn’t a bad thing. In fact, it’s even commanded in Scripture: “Let your requests be made known to God” (Phil. 4:6). Nevertheless, we tend to forget the global purpose of God’s Kingdom and focus solely on ourselves and the immediate lives around us. Think about the Lord’s Prayer for a moment. Jesus tells us to pray for our individual needs (“Give us this day our daily bread”), our relationships with those around us (“As we also forgive our debtors”) and for the entire world (“Your will be done, on earth as it is in heaven”). According to Jesus, the content of our prayers should go beyond ourselves! To help us with this, here are four simple practices that will widen the gaze of your prayer life. Pray Over Current News Events. Many people say that if you ever want to be depressed, turn on the news! I get it. There’s always a tragedy being reported or something terrible going on in the world. But what a great opportunity to pray! Most of us probably don’t read newspapers very often, but we do have access to the news all around us. Watch your local news today and begin praying for the needs presented on there. Visit more global news sites and pray for the needs you come across. The point is to pray for things that may not necessarily affect your personal situation. Pray for Unsaved People Groups. Even with today’s technology and the number of foreign missionaries, there are many people groups who have never heard the Gospel. How can we specifically pray for these people? Enter the Joshua Project. This site gives timely information on all of the unreached people groups in the world. The Joshua Project gives information about each people group including the largest religion, the percentage of Christians, and ways to pray for them. Not only this, but they offer many prayer resources as well! They have resources such as prayer guides, prayer calendars, prayer cards and prayer videos. They even have resources that you can download to present this information to your local church or small group. You can also visit their website each day to pray for a specific people group! Do you ever stop and think that somewhere in the world at this very moment, brothers and sisters in Christ are experiencing persecution? If I’m honest, I don’t think about this as much as I should. I imagine they could really use our prayers right about now. Enter the Voice of the Martyrs and their website, I Commit To Pray. This is a place to find specific requests of Christians who are being persecuted for their faith. What makes this experience more rewarding is that you can write prayers for these believers on their individual pages! Even if you don’t make use of this resource, make praying for the persecuted church a habit of your prayer life. Perhaps visualizing your prayer content is something that will widen your gaze. Below is a graphic of concentric squares to use when praying. 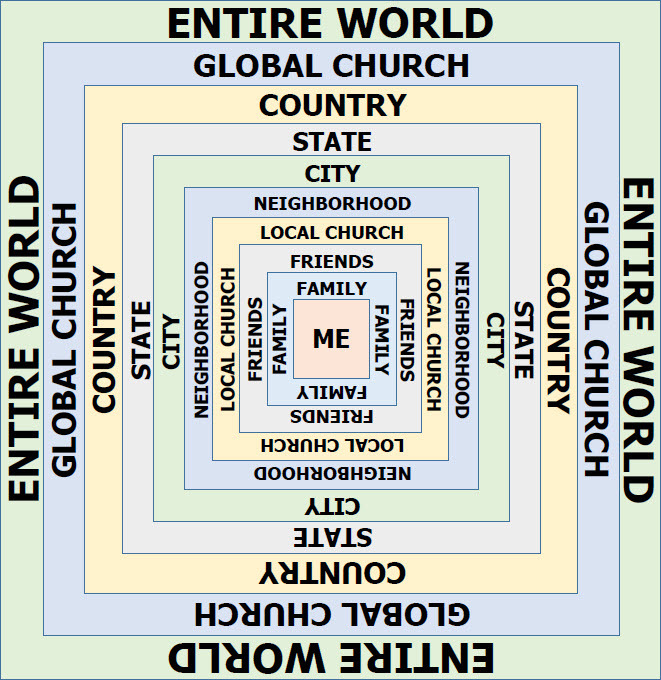 You begin by praying for your needs in the “Me” square, and then move outwards to Family, Friends, Local Church, etc. You can download and print this as a PDF here! Before you leave this page, stop and think about the content of your prayer life. Do you pray for those around the world? Do you pray for the needs beyond those in close proximity to you? If not, why not start today? Pray for current news events. Pray for unsaved people groups around the world. Pray for the persecuted church. Pray, pray, pray!